Glaucoma is an aetiologically complex disorder of optic neuropathies. Stressors related to age and intraocular pressure lead to progressive degeneration of the retinal ganglion cells. Clinically ophthalmic testing has been used to identify and quantify the functional and/or structural defects for diagnosis, assessing progression and therapeutic outcomes of glaucoma. There are multiple ocular structures, which could involve the causes and consequences of glaucoma at the cellular, molecular and genetic levels associated with functional changes. In this chapter, we would like to describe some ocular structures and functions highly relevant to glaucoma. No doubt, knowledge and information of retinal ganglion cells are critical for understanding glaucoma. The retinal ganglion cells are specialized projection neurons actively receiving visual signal through their dendrites and transmitting integrated visual information from the retina to the brain. Each subcellular component of the retinal ganglion cell is remarkably different in terms of structure, function and extracellular environment. Simplifying the retinal ganglion cells into a series of compartments, rather than attempting to understand it as a single, homogeneous structure, could be more useful for understanding pathogenic processes involved in optic neuropathies. To understand the mechanisms of maintaining normal intraocular pressure and pathogenesis of elevated intraocular pressure, the only treatable risk factor, we need to understand aqueous humour formation, aqueous fluid dynamics and outflow pathways. 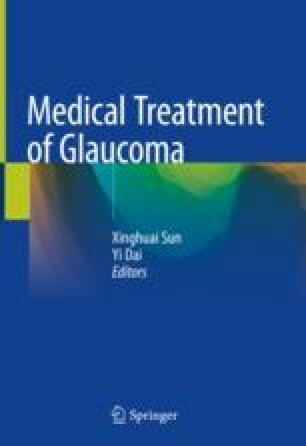 This knowledge and information are fundamentally important for understanding the pathogenesis of glaucoma, particularly primary open angle glaucoma, and therapeutic interventions. The epithelium of the ciliary body, posterior surface of the iris and the lens play a role in aqueous humour production and/or barrier function. Endothelial cells line the inner surface of the cornea, trabecular meshwork, Schlemm’s canal, the collector channels and aqueous vein plexus, and the aqueous vein. This chapter provides updated information about the structure and function of the endothelium and epithelium.